Each potential new referee will need to attend and complete the Entry Level Referee Course. The course consists of 15 hours of classroom work, A written rules exam, a referee skills exam, and an outdoor skills development session. 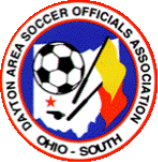 OHSAA welcomes beginning and experienced soccer officials. To find out more information, please go directly to OHSAA officials page.